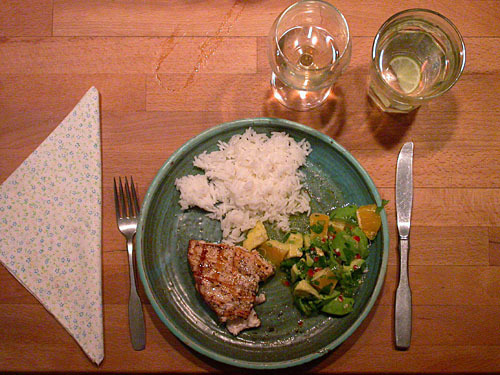 The swordfish is simply grilled. OK salted and peppered on one side, and then that side placed down on the grill. I used direct (duh – no choice with the Viking grill) medium heat, oiled the grill, and cooked the thick steak for about 4+ minutes on the first side, then flipped and cooked another 4ish minutes. I cut the fish in half at that point, and found the center was still pink. I left it another couple of minutes on that side and then returned it to the first side for 3 minutes. It suddenly looked a bit shrunken, but when I tried to pick it up I found it was delicate and flaky, and it turned out to be entirely delicious. The salad is orange sections (the picture in the book has you take them out of their membranes) which I cut in half, avocado (one whole, split between us), lemon and lime juices, green parts of scallions, and cilantro, and kosher salt. 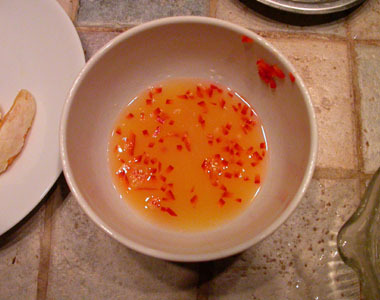 But over the salad goes a vinaigrette of orange, lime, and lemon juices, fish sauce, garlic, jalapeno (I used a fresh little fat red pepper instead b/c I forgot to tell D not to use all the jalapeno in the guacamole at lunch) olive oil, and kosher salt. The recipe recommends “plain rice to soak up the juices” and I cooked up some basmati rice, 1:2 with water. 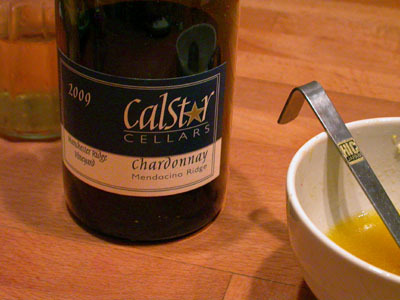 D chose a Calstar Mendocino Ridge Chardonnay (“Manchester Ridge Vineyard”), an unusual and fascinating wine which was amazingly perfect with the meal. It even liked the fish sauce. More of this! 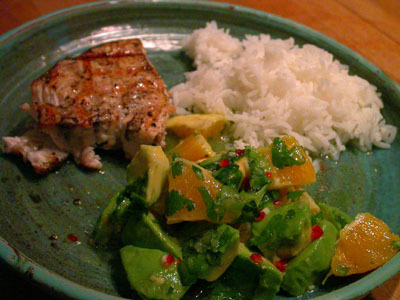 This entry was posted in Fish-centered and tagged avocado, basmati rice, calstar, Chardonnay, lemon, lime, orange, swordfish, Winery wine. Bookmark the permalink.